I LOVE, LOVE, LOVE, soup!!! I especially love soup when it’s fast, easy, cheap, healthy and delicious! 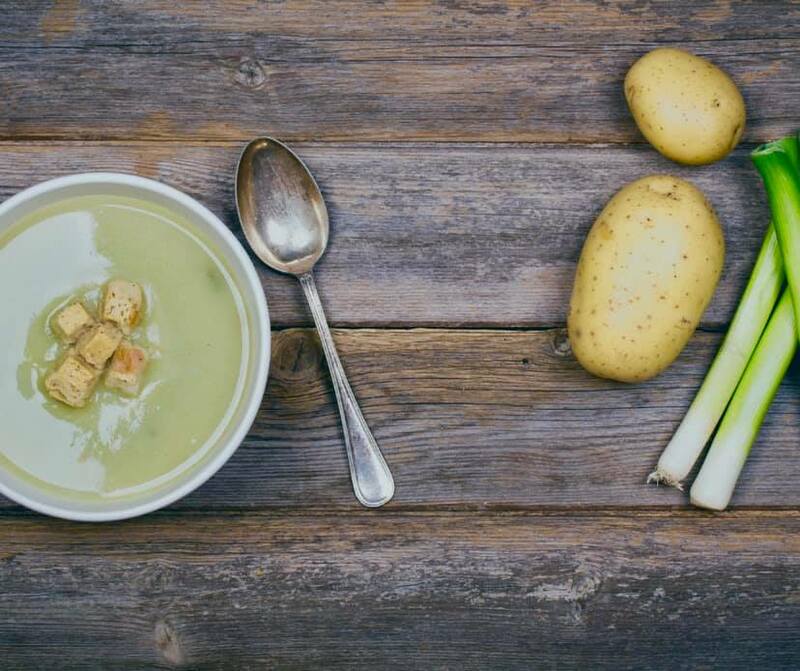 Potato Leek Soup is one of my personal favorites, but as someone who can’t do cream or milk, I struggle to find good comfort soup recipes that still taste great! I’ve played around a lot with this recipe, and it’s finally to a place that I’m proud to share it with all of you. The best part about this soup is it’s not only YUMMY, but it’s super healthy too and incorporates an ingredient that is all the rage right now….BONE BROTH (use veggie broth if making Vegan). Bone Broth is said to be rich in minerals that support the immune system and contain healing compounds like collagen, glutamine, glycine, and proline. The collagen in bone broth is said to heal your gut lining and reduces intestinal inflammation. Heat the olive oil in a pot over medium heat and saute the leeks for around 5 minutes until they are soft, stirring them occasionally. Season your leeks to taste with fresh sea salt and fresh ground pepper. Add your minced garlic and cook for about 30 seconds (don’t overcook the garlic or it will make the soup taste bitter). Add your cubed potatoes and your 3 cups of bone broth (you can also use chicken broth or vegetable stock) and bring them to a boil over medium-high heat. Cover with a lid and let cook for 10-12 minutes or until the potatoes are soft. Add your 3 cups of unsweetened almond or coconut milk (less or more depending on how thick you like your soup). Transfer mixture to a mixer, Vitamix or blender or hand blend on the stove. Puree until the soup is smooth. Add more salt, and pepper as need be and top with the delicious options above. Want to work with our entire coaching team and LIVE YOUR SUMMER? Join our upcoming challenge and learn to LIVE your Summer while working towards better health and fitness. We start May 6th.